Long-awaited, long-overdue: The Professionals as you have never seen them before. Bodie and Doyle need little by way of introduction but if the series had at all escaped you since its debut in 1977, their boss George Cowley, head of CI5 couldn't put it more succinctly than his opening gambit "anarchy, acts of terror, crimes against the public. To combat it I've got special men - experts from the army, the police, from every service. 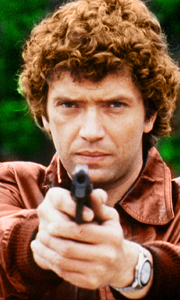 The..
Own The Professionals Mk II Blu-Ray from Deff, DVD, Blu-Ray & 4K Video Specialists - Free UK Delivery..
Own The Professionals Season 1 DVD from Deff, DVD, Blu-Ray & 4K Video Specialists - Free UK Delivery..
Own The Professionals Season 2 DVD from Deff, DVD, Blu-Ray & 4K Video Specialists - Free UK Delivery..
Own The Professionals Season 3 DVD from Deff, DVD, Blu-Ray & 4K Video Specialists - Free UK Delivery..
Own The Professionals Series 3 DVD from Deff, DVD, Blu-Ray & 4K Video Specialists - Free UK Delivery..
Own The Professionals MK I DVD from Deff, DVD, Blu-Ray & 4K Video Specialists - Free UK Delivery..
Own The Professionals - MK II DVD from Deff, DVD, Blu-Ray & 4K Video Specialists - Free UK Delivery..
Own The Professionals - MK III DVD from Deff, DVD, Blu-Ray & 4K Video Specialists - Free UK Delivery..
Own The Professionals MK III DVD from Deff, DVD, Blu-Ray & 4K Video Specialists - Free UK Delivery..
Own The Professionals MK IV Blu-Ray from Deff, DVD, Blu-Ray & 4K Video Specialists - Free UK Delivery..
Own The Professionals - MK IV DVD from Deff, DVD, Blu-Ray & 4K Video Specialists - Free UK Delivery..
Own The Professionals Complete Collection DVD from Deff, DVD, Blu-Ray & 4K Video Specialists - Free UK Delivery..